Who invented Apple? The name of the men credited with inventing the Apple corporation are Steve Jobs (1955 - 2011) and Steve Wozniak. When was Apple invented? Steve Jobs co-founded Apple Computer Company with Steve Wozniak in April 1, 1976, during the Technology and Information Age of inventions. The establishment of Apple Inc. resulted in major innovations in the field of Computing, Communications and Technology. Apple became a successful global company with a cool brand image whose products resonated with their loyal customers. Definition of Apple: Apple is defined as the brand name of an American multi-national technology company that designs and develops computer software, electronics and online services. Famous products produced by Apple include the iPhone, iPad, iPod and Apple Mac personal computer. Fact 1: Who invented Apple? Apple was co-founded by Steve Jobs and Steve Wozniak on April 1, 1976 during the Technology and Information Age of inventions which was a marked addition to advancements made in the area of Computing and Technology. Fact 2: Who invented Apple? There was a third co-founder of Apple Computer Company, Ronald Wayne as the "adult supervision" for the venture, but he relinquished his equity in the company for $800 dollars 12 days later, on April 12, 1976. Fact 3: Who invented Apple? Prior to the establishment of Apple in April 1, 1976, the history of the computer had progressed at a rapid rate. The computer chip and the first Internet, called ARPANET, was developed in 1969 and in 1971 Ray Tomlinson invented Email. The floppy disk was invented by David Noble with IBM in 1971 and in 1972 Atari released Pong, the first commercial video game. Altair produced the first portable computer in 1975 and Microsoft was founded by Bill Gates and Paul Allen. Fact 4: Who invented Apple? When Steve Jobs and Steve Wozniak founded Apple in 1976 computers were still in their infancy. Adam Osborne went on to invent the Laptop Computer in 1981 but it would be another 10 years before Tim Berners-Lee would invent the World Wide Web in 1991 and another 7 years before Larry Page and Sergey Brin would invent the Google search engine. Fact 5: Who invented Apple? Steve Wozniak was born on August 11, 1950 in San Jose, California and Steve Jobs, was born on February 24, 1955 in San Francisco, California. Woz was educated at the University of California, Berkeley and Steve Jobs attended Reed College, Portland, Oregon. Fact 6: Who invented Apple? Steve Jobs and Steve Wozniak were both raised in Santa Clara Valley of San Francisco would one day be famously become a famous technological center nicknamed 'Silicon Valley' due to the large number of silicon chip innovators, electronics engineers and entrepreneurs in the area. Fact 7: Who invented Apple? In 1969 Steve Jobs met Steve Wozniak, who was five years older, at the both belonged to the Homebrew Computer Club. Steve and Woz shared many common interests such as computers, electronics and Bob Dylan. The friendship between Steve Jobs and Steve Wozniak would lead to the pair co-founding Apple Inc. Fact 8: Who invented Apple? Steve Wozniak was a technical wizard (who would later be referred to as "The Wonderful Wizard of Woz") and had been developing a new type of Personal Computer after being inspired by the release of the Altair portable computer in 1975. Steve Jobs recognized the marketing potential of his friends new design and the two young men decided to start their own company. Fact 9: Who invented Apple? On April 1, 1976 Steve Jobs and Steve Wozniak raised $1,300 dollars in startup money by selling Woz's scientific calculator and Steve's Volkswagen van. They named their business Apple Computer Company. Fact 10: Who invented Apple? Steve and Woz started selling computer circuit boards whilst working on their computer prototype. The developed a small, portable computer that would be suitable for personal use. Fact 11: Who invented Apple? By 1977 Apple produced the first mass-market personal computer. Apple went public and the Apple Macintosh became a global phenonomen in 1984, just before Steve Job's 30th birthday. Fact 12: Who invented Apple? Steve Wozniak retired in 1985 after he and Steve Jobs received the National Technology Award from President Ronald Reagan. Fact 13: Who invented Apple? In 2001 Steve Jobs at Apple introduced the famous "Digital Hub" strategy, a clever, cohesive, plan to make all digital devices even more useful through the power of newly developed software. Apple announced a "breakthrough digital device" that they called the iPod. Fact 14: Who invented Apple? On October 23, 2001 Apple unveiled the iPod to the public. Their new, innovative MP3 music player, the iPod, was different from all other MP3 players on the market. The iPod had a high quality, strong, stylish case and boasted large storage capacities and an intuitive interface. Apple then released released its iTunes music jukebox software and the iPod mini followed in 2004. Fact 15: Who invented Apple? In 2007 Smartphones took a huge leap when Apple introduced the iPhone and its revolutionary touch-screen interface. The design of the Apple iPhone was exceptional featuring an elegant glass-and-stainless-steel case. The Apple iPhone combined many features of the iPod, the Cell Phone and a digital camera. Fact 16: Who invented Apple? On July 11, 2008 the company opened the "App Store". Apps were destined to play a pivitol role in the development and success of their next innovation - the iPad. Fact 17: Who invented Apple? Apple launched the iPad tablet computer on April 3, 2010 with a 9.7-inch display, a 10-hour battery life and a powerful processor and was designed to run on the iOS mobile operating system. By the end of the year Apple Inc. had sold 15 million iPads and users converged on the App Store which had over 350,000 apps available, of which 65,000 had been designed specifically for the iPad. Fact 18: Who invented Apple? In 2011 the company unveiled the iCloud, enabling users to wirelessly back up iOS devices in order to store and synchronize digital content across numerous iOS-supported devices such as iPads, iPhones and iPod Touches. Fact 19: Who invented Apple? 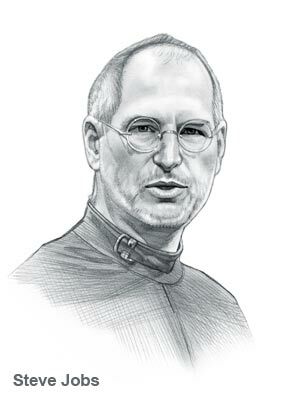 On October 5, 2012 Steve Jobs sadly died of pancreatic cancer. The iCloud was his final innovation and the last piece of his jigsaw known as the "Digital Hub" strategy. He will be forever remembered as one of the greatest innovators of all time and the man who co-founded Apple.